For Lynn Vidali Gautschi, swimming is an irreplaceable feeling, a liberating way to navigate not only a pool, but the world at large. The San Francisco native first learned to swim at age five. Years later, as a two-time Olympic medalist and career educator, she is still struck by the freedom that the water offers. Swimming was more than an outlet for Gautschi, who as a child growing up “on the other side of the railroad tracks” witnessed—and to some extent, participated in—the social changes of the civil rights era. As a competitive swimmer, she focused on her stroke, the splash of her limbs cutting through the water, staying in her lane. When she traveled to compete, however, she confronted the reality of a changing political landscape. While competing in the South, she noticed the signs distinguishing “black” and “white” water fountains. What gave her the confidence to defy social norms at such a young age? Gautschi always knew that her power lived in the water, with the speed of her stroke and the precision of her technique. She also knew that competitive sport could bring tremendous opportunity. At age 12, she was awestruck watching Donna de Varona medal at the 1964 Olympics. Her eyes on the television, she told her mother, “I’m going to the next Olympic Games and I’m going to win a gold medal.” Emboldened by de Varona’s success, Gautschi dedicated herself to training. Two years later, she broke a world record in the 200-meter individual medley at Foothill Junior College, an early career highlight that intensified her appetite for competition. Gautschi’s craving for world-class training took her to the Santa Clara Swim Club, home to Olympic hopefuls such as Mark Spitz and de Varona herself. She left her family home at 15 to train with the indomitable coach George Haines, a bold choice for a young woman still in high school. She rented a room with a Santa Clara swim family, transferred to Santa Clara High School and trained four hours a day. Even as a teenager she recognized the sacrifices that her parents made to support her, paying her rent while they earned a working class living 65 miles away. Gautschi acknowledges that her family’s support was unique, especially in 1965, when the options for young women pursuing competitive sport were somewhat limited. In the pool, Gautschi felt the need to prove to her family that they were right to invest in her. Her efforts paid off when she made it to the ’68 Olympics in Mexico City at only 16 years old, making good on the promise she’d made her mother. She completed the 400-meter individual medley in an impressive five minutes 22.2 seconds, earning a silver medal. She could not have known what the ’68 Olympics had in store: Olympic track stars John Carlos, ’05 Honorary Doctorate, and Tommie Smith, ’69 Social Science, ’05 Honorary Doctorate, creating history by raising their fists on the podium in a salute to the human rights struggle. The teenage Gautschi was thrilled to meet Carlos, and though she was still years away from attending San Jose State herself, she felt a kinship with their commitment to sport and social justice. Upon returning to California, she graduated from Santa Clara High School and enrolled at West Valley College, still devoted to developing as a swimmer. In 1972, she qualified to join the Olympics once more in Munich. Though she relished the excitement of the games, both of her Olympic experiences were marked by violence related to or surrounding the competition. Despite this, Gautschi still brought home a bronze medal in the 200-meter individual medley. Once again she ran into Carlos, who at the time was working for Puma, and asked her to wear a pair of his shoes on the Olympic podium. Gautschi compromised and wore one Puma and one Adidas shoe, proud to represent her country and the athletes she admired. Her career in swimming had only just begun. She transferred to San Jose State with the support of one of the first athletic scholarships for women, offered through the Association for Intercollegiate Athletics for Women (AIAW). The National Collegiate Athletic Association (NCAA) did not yet offer opportunities or scholarships for woman athletes. Gautschi never lost a race at San Jose State. Comfortable as she was in the pool, she struggled in the classroom. She eventually discovered that she could multiply the joy she felt in the water by teaching physical education and coaching swimming. In her final year at SJSU, she quit swimming to focus on student-teaching for her credential. After graduating, she accepted a job teaching high school PE and coaching swimming, launching a 34-year career. Her two children competed in swimming and water polo. By the time she retired, they had become coaches themselves. Her favorite part of coaching? Watching children discover their own version of the feeling she’d felt years ago in the San Francisco Parks and Recreation pool—that weightlessness that promised opportunities no longer out of reach. Though Gautschi claims to be retired, she still teaches lessons in her home pool and often takes time to swim herself. It has been years since she has competed, but she has a different appreciation for the sport now. 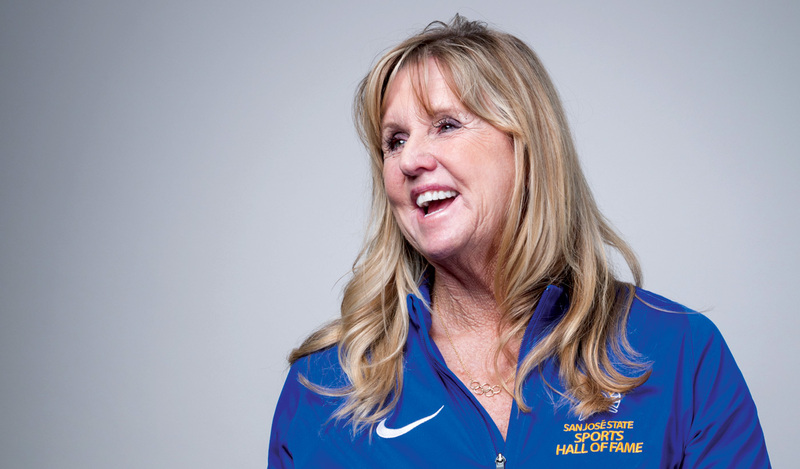 From Olympic swimmer Lynn Vidali Gautschi, ’76 Kinesiology, ’77 Teaching Credential, to record-breaking gymnast Thomasina Wallace, ’12 Kinesiology, generations of Spartan women have led successful careers in sport. Read The Women in Sport Stories.